Helen spends her days writing, shooting, editing – and eating a *lot* of BBQ. MANY SUCCESSFUL PEOPLE out there started out on one career path and ended up following something totally different. Gordon Ramsay, for example, once played with Glasgow Rangers FC, before going on to becoming the foul-mouthed Michelin-starred chef we now know. Helen Graves is a freelance recipe developer, food and travel writer these days, but she worked in psychology research in the UK for more than 10 years before her food blog gradually grew a life of its own. Since then, Helen’s passion for food has turned into a spectacularly accomplished career. She has written for publications across the UK and is editor of Pit, an independent magazine about live fire cooking and smoking. “I do a lot of great shoots for Pit where we work with barbecue chefs or producers to create something special,” says Helen, a self-proclaimed sandwich and BBQ addict. Helen’s Instagram account is enviable and definitely drool-worthy, with photos from all of her work on photoshoots as well as recipes in development – and a whole lot of meat. 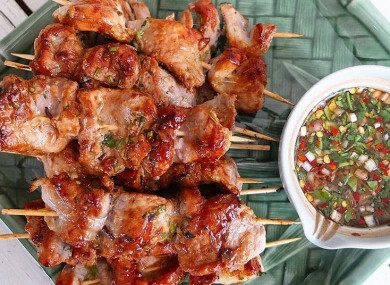 I made moo ping yesterday - grilled pork skewers sticky with coconut milk and funky with fish sauce. Pretty punchy dipping sauce too. I remember the first time I ever had these at a BBQ, cooked for me by my buddy @hollow_legs 😘. My mind was blown. The caramelisation on fatty pork is 👌🏼. This is my recipe for @gbchefs coming soon! Email “5 things I've learned: Recipe writer Helen Graves on why you should always clean as you go”. Feedback on “5 things I've learned: Recipe writer Helen Graves on why you should always clean as you go”.